Some of Oakland’s busiest places are little visited and little noticed. 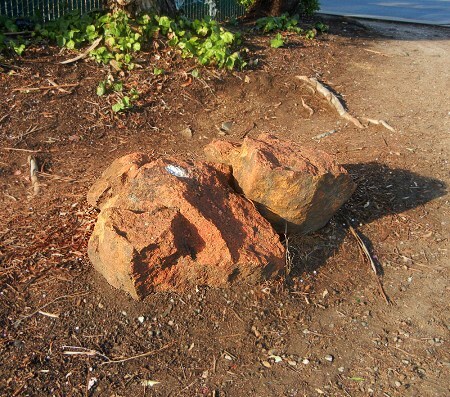 This set of boulders sits at the intersection of MacArthur and Foothill Boulevards, up by the Eastmont Transit Center. The stuff of these boulders appears to be the hematite ore of upper Lion Creek. It almost looks like they would fit together in a larger rock. Who knows how they got here. Somewhere in the city’s maintenance yards there must be a stockpile of Oakland boulders, kept handy for deployments like this where you want to keep cars off the dirt and on the road. This entry was posted on 29 November 2014 at 7:23 pm and is filed under Oakland rocks. You can follow any responses to this entry through the RSS 2.0 feed. You can skip to the end and leave a response. Pinging is currently not allowed.